The majority of both temperate and tropical basidiomycetes can produce a battery of hydrolytic enzymes to decompose cellulose, hemicellulose and sometimes also lignin (Chapter 2), including cellulases, pectinases, lignin peroxidise and laccases (Ohga and Royse, 2001; Nyanhongo et al., 2002; Pointing et al., 2005). 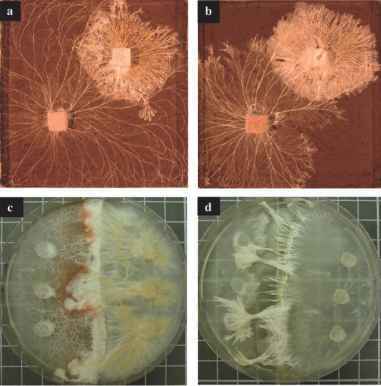 Temperature stress can affect enzyme production by basidiomycetes. Studies on Trametes trogii showed that pectinolytic enzymes such as polymethyl-galacturonase, polygalacturanase and pectin lyase were optimally produced over the range 23-28°C. Interestingly while growth under these conditions was optimum at pH 3.3, a pH of 4.5 was best for production of pectinolytic enzymes with production occurring even at 6.2-6.5 (Levin and Forchiassin, 2004). Temperature range and stress has also been shown to have a significant impact on enzyme production. Abortiporus biennis, T. versicolor and Cerrena unicolor have been shown to produce enhanced extracellular peroxidise, superoxidase dismutase and laccase activities following exposure of cultures to marginal high (40°C) and low temperature (<10°C) stress (Fink-Boots et al., 1999). The activation of laccase and peroxidise was rapid (within 96 h) and suggests that biosynthesis of such enzymes is activated rapidly by basidiomycete decay fungi when encountering lignin-based matrices, in both temperate and tropical ecosystems. Studies on a strain of T. modesta used a central composite statistical design approach to identify optimum environmental conditions for laccase production (Nyanhongo et al., 2002). This showed that an initial pH of 6.95 and temperature of 30.26°C were optimum for enzyme production. Laccase production was optimal after 6-7 days, while that for other enzymes, such as mannose, was after 3-4 days under optimum temperature conditions. Laccase activity was very stable over a range of temperatures and pH values with optimum at pH 4.5 and 40°C. Solid organic resources undergoing fungal decomposition may be regarded as a matrix consisting of a solid phase comprised of various lignocellulosic materials and a system of fluid filled voids. Matric potential is commonly a major influence on overall water availability. For a fungus growing within a resource, it is the spatio-temporal distribution of water in relation to the location of hyphae which is important (Boddy, 1986). Effect of changes in water potential on laccase and cellulase production by Lentinula edodes has been quantified using RT-PCR (Ohga and Royse, 2001). Water potential of the resource changed from —0.5 MPa to —1.5 to —2.0 MPa over the fruiting period (Ohga et al., 1998). Cellulase production increased over a 5-10 day period. In contrast, laccase decreased in the drier treatments. Where resource water potential was maintained at a steady-state then both laccase and cellulase activity remained relatively stable over the 15 day cultivation period. Note: In all cases the soil microcosms were inoculated with colonised woodchips (5%) and mixed with soil before incubation. influence of interacting environmental conditions of water x temperature x pH stress on enzyme production by basidiomycetes. Biotechnological applications of enzymes produced by saprotrophic basidiomycetes, especially white-rot fungi, have received significant attention (Wessenberg et al., 2003). This is because of the potential for producing copious amounts of extracellular ligninases and laccases in both free fermentation and immobilised systems for industrial applications. Enzymes such as ligninanse and laccases have been successfully applied to the clean up of waste-water streams from the textile industry specifically for the decolourisation and degradation of toxic dyes before discharge into the environment.